Three weeks after teachers and their class return from Ardroy, we ask them to complete a brief online poll, to record any changes they have seen post Ardroy. These are then summarised at the end of every academic year. 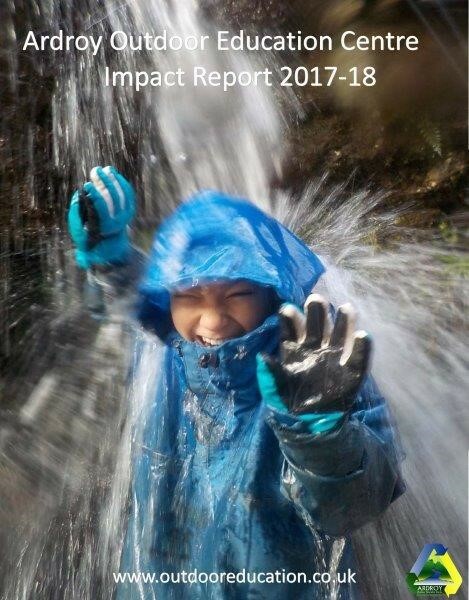 We would encourage you to download and read these reports by following the links above - they quantify very well the long term developmental changes Ardroy has on learners. Please read on for our most recent feedback, but every now and then we take all of the comments we get and turn them into a 'Wordle'. It sums up rather nicely what people think of our delivery! The whole week has been positive, our whole group has had an excellent week, one child said today 'This has been the best day of my life'. The Ardroy 'routine' is fantastic, the children are given the perfect amount of guidance so that they can focus on the activity. The John Muir diaries will help our children to complete their award - thank you. The instructors build relationships very quickly which enables them to become attuned to any difficulty with a child. They strive to support the emotional wellbeing of the children, as a priority, and ensure they communicate well with teaching staff. The SHANARRI well being indicators are truly embedded within the Ardroy experience. Ardroy Instructors are all superb at getting to know children and can get the best out of them, including ASN children. Away day was superb and will be a memorable experience for all. Lost at sea was great at pulling children together and encouraging them to work together as a team, something not all children are good at. The children were involved in planning and decision making throughout the week. Activities were adapted/changed to suit the children's needs and interests. As always the instructors were outstanding - patient, understanding, humorous, caring, thoughtful, professional, knowledgeable and ensured that the children had the best experience possible. It has been wonderful to see children who wouldn't normally achieve academically, thrive and develop their self-confidence and resilience. The prep time before activities was particularly good as the learning pit was used as an example which linked in well with our school learning. Some of our less confident pupils have had the opportunity to lead during activities and loved the success! A fantastic team who really got to know our children and helped them throughout all activities. Great communication with all staff. Everything was well organised and all children were supported. I love coming to Ardroy. I think that the experience given to the pupils is outstanding and something they will remember for a lifetime. Another great week where the kids have grown in confidence and independence whilst having the opportunity to explore and learn through the environment and challenging activities. Thank you to all the staff. Thank you so much for giving us this opportunity. We all thoroughly enjoyed ourselves, were challenged, learned a lot and grew as human beings. The world is now a little smaller to our Flagstaff girls but bigger in terms of being more confident as individuals and as a group. Continue the excellence offered here! All activities were excellent as per usual. Professionalism of instructors second to none. The instructor's relationship with children is major feature of Ardroy. Thank you so much for making my first 'challenge' experience so much easier - it felt great to know I had your incredible team to help us achieve our goals and to look after our young people. And you are all fab! The overnight hike has been fantastic, it was great that each group could tailor it to their needs and it was a good adventure for them. The Instructors ensured that the children's safety and enjoyment were paramount. Many thanks once again for giving the children such an exciting and memorable week that will stay with them for a lifetime. Ardroy has been a positive experience for the pupils at Kenoway Primary School. The staff at Ardroy have been so welcoming kind and helpful. The whole team have made our experience memorable. The children have learned so much about themselves, peers and teachers! Thank you! Another fantastic week. Once again made to feel extremely welcome and that nothing was a problem. The children's progress in listening, supporting each other and developing independence has come on in leaps and bounds. Seeing the joy and the thrill that many of them got from their achievements makes it all worth it. Many thanks to all of the staff for the care, support and encouragement towards all the kids. Children have had a fantastic experience, loving all the activities. They have faced many challenges, overcome fears and achieved much. Thank you all so much for a fab week! Many thanks to all staff involved for helping to challenge, support and look after our group during their visit. They are taking away lots of memories and stories. See you next year! Instructors were amazing! The attention to the young people, they made an effort with each young person and it really made the difference with their whole experience. Thank you. Great week as always. Challenges conquered and memories made. All the activities were engaging and challenging. Great to see the children pushing themselves outside their comfort zone. We all enjoyed the food and the dorms were clean and comfortable. A massive thank you to all at Ardroy for ensuring this was a fantastic experience for our children. We are incredibly grateful for the additional measures put in place and the dedication of all staff. The instructors really engaged with the children and pulled them together as a team. Overall they gauged their abilities well and set an appropriate level of challenge and also encouraged them to be more independent. All the activities were successful and the instructors were fantastic with the children. The level of independence expected from the children is great. It was a fantastic week for some pupils who lack confidence. They were encouraged to push themselves and have success in a different environment. Instructors were all awesome! All staff have been extremely helpful and friendly. They have looked after the staff as well as the kids! As always, we have had a fantastic week. All activities have suited the children, and we've enjoyed our first attempt at the John Muir Award. Thanks for a great stay, and we look forward to seeing you next year! Had a fantastic adventure day in the snow, good level of challenge. Woodland skills had excellent practical life skills, challenged different children in a variety of ways. We have had a lovely time, and felt in very good hands. The flexibility of the staff was great before & during our visit. Both instructors were brilliant, they got the best out of each child and understood each child's needs. They also have the patience of saints! Really appreciated that they adapted the Lost at Sea day to make the most of the better weather. Thank you for an amazing week. The children have grown in confidence, developed their resilience and gained skills we cannot teach in school. Food was awesome as always! The programme was adaptable and staff were flexible to the needs of our children. Children focussed on 'John Muir ethos'/CfE at all times. Children were given roles and responsibilities. Children are really listened to. Everyone at Ardroy was friendly to children. Kitchen staff ensured the children were eating. Heating superb! Cosy & lots of hot water. Particularly successful: Quality of questioning/reviewing; support & encouragement during activities; catering. The instructors really responded to the needs of the children and were very supportive. They adapted and were quick to respond to requests to focus on a particular skill, and had really good ideas. They were keen to ensure they were focussing on what we wanted. As a teacher it is a valuable experience to watch (and learn). We seldom have the luxury to watch our children grow & learn in such a direct & immediate way. The relationship between the instructors and the children has been superb. All are so patient, professional and nurturing. The children have all really enjoyed working with them. The balance of activities was great. Two full days out and the Splosh/Jacob's Ladder on the other day worked very well. Having the evening activity split over two activities helped to engage more children at what can be a less structured time - ie less children gravitating to friendship groups and more mixing in teams/work groups. The staff as a whole were great - leaders, kitchen staff, cleaning staff. All very caring and supportive. Activities were excellent, and leaders ensured that they suited the needs of the children. We have a clear vision of what we need to work on when we get back to school thanks to Ardroy! The relationship between the instructors and pupils was particularly successful, particularly with ASN pupils. Perfect balance of fun, safety, pupil ownership and involvement, challenge and nurture. One of our main aims is to see how the children develop their teamwork skills and as always we see children who struggle with this at school come out of their shells and work with their peers. This is testament to how well Ardroy's instructors form connections within the groups. Keeping the same instructor all week to develop and strengthen these connections is an excellent format. Successful things from this week would include.....Twitter/online photos a fantastic development. Quality of instruction, range of activities, the level of engagement. Hooking children's interests through power points and videos. Children encouraged to reach decisions themselves, promoting leadership. Thank you so much for an amazing week. Organisation of everything was really successful! Runs really smoothly and children enjoyed everything offered to them. Flexibility of staff/programme. We opted not to do the environmental art on the beach and the games provided in the archery hall were fab. Thank you so much to all the staff, it's been amazing to see all the children blossom and grow. Lots of happy children with amazing life long memories. We've had an excellent week all round. It has challenged us to consider how we ensure ongoing impact. All activities were adapted accordingly to the needs/abilities of each group. Children were challenged and nurtured every step of the way. I feel very fortunate to have seen every child flourish this week emotionally and socially. As well as this, new friendships have also formed. Each child will leave here with a big smile on their face and fond memories of their wonderful week. Ardroy has shown them that you can truly do anything and that fear is something easily overcome through teamwork, determination and self belief. Variety of activities was great. A weekend met our needs, instructors' knowledge, patience and skill much appreciated. Food! Great quality and quantity as always. Very helpful kitchen staff. The nightline was particularly successful with Chris spending extra time with the group. Adventure days were fantastic - loads packed in and all the groups did slightly different things. Instructors were really aware of pupil's needs and really built up a relationship with them. Instructors adapted programmes to suit our groups and issues that arose. Very approachable staff. The instructor's rapport with children was excellent. The needs of the children were realised and met with appropriate adaptations. We were particularly impressed with how our instructors adapted their styles for individuals, e.g playing the sheep game with one child, thinking of different ways to engage all the children during reflection times, understanding the speed that the different groups needed to move at. Relationships - all instructors have individual styles, but also match their styles to each group and it's dynamic. Good mix of providing the children with information and letting them discover thiings for themselves. Thank you for another fabulous week. Kids and staff have all had a ball! Looking forward to the 2018 trip already. Everything runs like clockwork, nothing seems too much trouble for the instructors and staff. Everyone was very encouraging, and got the children to try things that they wouldn't have done. It makes such a difference for our kids to have opportunities like this that they wouldn't normally get. All instructors were fantastic with all our children. They built up relationships quickly, recognising each child's capabilities; and adapted activities to allow all children the opportunity to take part and experience success. Plenaries offered the children the chance to reflect on their own performance and look for next steps, both personally and as a team. Buckhaven could not praise the instructors and staff enough - have thoroughly enjoyed the week. Thanks to the instructors, the teachers have had an opportunity to stand back and watch the children achieving life skills - resilience and teamwork. From the very beginning of our experience we felt very looked after by everyone at Ardroy. The staff were all very professional and our daily timetable was very well timed and co-ordinated. The children have commented on their enjoyment of the experience and how they have taken away new skills and achievements. The instructors further enforced this throughout the week through looking at 'Growth Mindset', an initiative we are looking at in school. We all thoroughly enjoyed our stay at Ardroy and look forward to returning next year! The daily programmes are very well planned. The staff know what they are doing and manage the timetables in an admirable way. Very good security, everything is thought about. As always the calibre of the instructors was exceptional. Patience of Saints! Always build in a really good rapport with kids. Structure and organisation is always really good, children benefit from this. Thank you so much for another wonderful week. Valley PS cannot express our gratitude enough for a fantastic week of fun learning. We'll be back! Instructors were very knowledgable, fantastic with pupils, making things fun. Great that waterproofs & wellies were provided for children and adults. Safety was a priority for pupils, very thorough. Great for helping pupils be more responsible. The outdoor adventure day was super. A lot of thought went into it. Every time we do it there are differences, so each one is a unique experience. Children are trusted to make decisions, use tools they wouldn't be allowed to at home, and feel they have accomplished something at the end. Another fantastic year at Ardroy. All the children are made to feel special here. They are valued, which increases their confidence and motivation to interact with the group. All instructors are amazing - professional, knowledgable, kind, helpful etc. Brilliant! Quality and quantity of food is amazing too! Able to take part in activities, doing things that they would never have had opportunities to do, & able to challenge themselves. Young carers and staff had a fantastic time and loved every minute of it. Another fantastic week. The children are leaving more confident, ambitious, better at teamwork and exhausted from a week of excellent outdoor activities. Children really enjoyed completing the John Muir diaries and keeping evidence of their learning. Thank you very much for all your support this week. The children have had a brilliant experience and are really keen to come back again! Very impressed by instructors' ability to really get the children thinking about their perceptions and expectations, and how these might be limiting them; a great balance of pushing beyond their comfort zone but making them feel they can do it. Great recognition of children's personal achievements and appropriate 'targets' for individuals. Great questioning! All activities, regardless of the weather, were challenging, fun and memorable. All staff have an outstanding attitude and rapport with children. Worked with us really well - felt part of the team. Thank you to all Ardroy staff. Your ethos is our ethos and our pupils gain an enormous amount socially, personally and in terms of impact across learning, through their week here. Ethos of protecting planet - recycling, food waste etc. Life Skills - tidying room, responsibility for own belongings, dorm duties. Another fantastic and enjoyable trip for both staff and students. Thank you! The instructors were an amazing crew, understanding and empathetic of the needs of our young people. We felt as a staff, that NCS staff and Ardroy staff were working as one. Losing the two bags of Maria and Jacob on the first day was upsetting for the two young people, but Ardroy put this right straight away with a huge effort. Thank you so, so much - it made a real difference. Thank you to all for your careful planning and organisation, your patience and understanding in every situation. Staff and children have all had an absolute ball and have learned so much about themselves and each other. Everyone at Ardroy has had a huge, positive impact on the centre and the week. As always it has been enjoyable, informative and challenging in the right measure and this is largely due to all the staff and how the centre is organised and run. Many thanks! Instructors had great relationships with the pupils, great rapport all week. The activities pulled the pupils together and encouraged teamwork. Low ropes activity during Lost at sea was an excellent addition! A great week for our pupils again. Great organisation as always. can't wait to bring the kids back! Everyone - including adults - have had a fantastic experience. Children realising their own potential and challenging their own limits. Thanks to everyone involved. Loved the full day out activities across the loch and back. Children's participation in all events was great. Children enthusiastic about all activities, food, and experiences. Thank you for an entertaining activity weekend, as always staff have been great; very accommodating to the needs of children and staff. A very enjoyable week. Thank you for providing our children with a brilliant experience. Your instructors are "Pros" at what they do. They dealt with our children appropriately - very nurturing! The relationship that instructors have all had with each group has been great. We've had four schools here together and everyone has mixed really well. Definitely a great transition week leading to high school. The organisation of everything throughout the week runs very smoothly and as a headteacher I trust the centre and know we're in very safe and capable hands. Nothing jumps to mind that needs to be improved! A big thank-you from us all. The children have had a blast and have had a brilliant learning experience. A great week had by all - the pupils have had an unforgettable experience and have learned about their own strengths in a safe environment. Thank you to all of the instructors who have supported our pupils and kept them safe. My twenty-sixth trip to Ardroy, and the best one ever! Having the security of a well-structured routine and timetable allowed children and staff to feel secure and relaxed, thus allowing the children to focus and enjoy their new experiences. Ardroy staff's excellent engagement with the children and their efficiency enhanced every experience! Thank you. At no point were there any concerns regarding the children's security and safety. Thanks very much for a FANTASTIC week - we have all had an amazing experience and will be taking more than our dirty washing home. The staff here are an asset to the children's education and we have enjoyed working with them. We had an amazing experience, as did the children, so thank you. We will recommend Ardroy and will be back. The Lost as Sea activity helped the children work together as a team, something they struggle to do at home/school. All children were able to achieve success and staff were excellent at praising children and encouraging and supporting those who required. As a first time participant, I can honestly say that the kids and I have all had a fantastic experience from start to finish. In particular, the staff are second to none, their knowledge and experience is fantastic, and I felt really comfortable leaving the children in their capable hands. The activities were exciting, fun, relevant, challenging, and met the needs of all the children. I cannot emphasize enough how great the week has been. Very stress free for me as a teacher and thoroughly beneficial for all the children. Individually, everybody has gained something from the week, and I am looking forward to seeing how the experience has changed the class dynamics, how much more confident they are and how they have become more independent as learners. Very much hoping to return next year. THANK YOU!! All very successful in a variety of different ways: children have developed an amazing sense of teamwork, displayed a high degree of responsibility, and we are taking home confident, successfuul and extremely happy children. A huge thank you to all Ardroy staff who together have made us feel very welcome, relaxed and safe. A professional team of people who have made us all laugh. Thank you! All the Centre staff were welcoming & friendly, very helpful and accommodating. Nothing was too much trouble! We have all really enjoyed our stay and we would definitely come again. Thank you! The range of activities which were challenging but within reach and allowed everyone the opportunity to achieve and excel. Super-fun programme, understanding instructors, jam-packed to minimise time for children to get bored or homesick. All instructors were extremely well suited to their groups which made the week enjoyable for all. The group of children brought have had difficulty working together, especially between the two separate classes. This week has broken down barriers, and we have seen the children work together. Children have commented on how much they have learned about themselves and other people. Yet again we've had an amazing week. Thanks to everyone :)! Journey days and Woodland days were very good. All children were very engaged and couldn't wait to share their adventures with their classmates on their return. Jacob's Ladder was the big hit and it was the biggest challenge for most. The looks on their faces, and the teamwork being shown, was brilliant! Everything has been brilliant. Food exceptional! All staff amazing with our kids and our staff. Thank you for another fantastic year!! Particularly successful were the more informal review sessions during and after activities, focussing on how well they had work as a team and the part each had played. All the instructors have been fantastic. They quickly built relationships with the groups and got to know them and their personalities, and were able to bring out the best in them. They were also amazingly patient with some of the bad listeners! Would recommend to others and definitely use again. All staff were lovely, Jenny for helping to organise, nothing was too much trouble. Steve & Nicky for organising activities and putting in an extra. Interacted great with our young people. Made everything fun even the serious instructions. Fantastic. 10/10 :). Children were working towards John Muir Explorer Award. Instructors gave children opportunities to plan and organise their own days out with the challenge, knowledge and skill development built in throughout the day. All activities were fantastic. The relationships between the instructors and children developed quickly, thanks to Kevin, Cam and Simon for their support and encouragement for all children to fulfil their potential. Great week had by all :). Instructors bonded superbly with the groups of young people. A delight to work with. Well organised. Ran like clockwork. We couldn't have had a more successful trip! The instructors met the needs of the young people on a daily basis. By the end of the week the young people felt they didn't want to leave. True story! What a fantastic team of staff , thank you! A warm friendly atmosphere and personal investment with the group have made this Personal Challenge section quite special. All aspects and delivery to National Citizen Service was outstanding, professional, and on a very personal level. The delivery was well above average with no issue too big or small, and as an NCS team all staff & young people have had positive responses to how we were looked after. Thank you. Every child is leaving today shattered, but with big smiles on their faces. I've seen them thrive in very challenging situations, showing resilience, collaboration, conscientiousness and maturity. We were extremely impressed with the professionalism of everyone this week. The strong environmental message is exactly what we were hoping for, which added to the great fun that the children had doing all the activities. We also valued the feedback sessions the children had so that they had an opportunity for some guided reflection on what they had learned. Thank you for a wonderful week in such a beautiful location. We are leaving for home feeling tired but very happy with memories to last a lifetime! All instructors were fantastic with all children, especially Keith and Suzy with those with additional support needs. These children have participated in all activities to the full, and this has been a huge achievement for them. The children were encouraged to work together as a team throughout. The set up of 'Lost at Sea' was very successful - it encouraged the children from the start. They were encouraged to get out of their comfort zone and were praised for taking responsibility not only for themselves but also for the group. Children loved the adventure day and abseiling - this was a great combination. Having all equipment provided was great, and meant the children and staff didn't have to worry about getting dirty. The organisation of the dining room & clean up was very slick. Children having a bit of responsibility at the right level was great! Health and safety very good, all safety was double checked and very secure. Good interactions with staff and children, they were encouraged, supported but also disciplined well when needed. Good communication of activities and expectations. Planning and evaluating the activities very good, we enjoyed 'Lost at Sea' - very supportive to achieve aims. This has been a fantastic experience and I think everyone has got a lot from it. Thank you all for all your kindness, help and support this week. The children were challenged, but not pushed into activities they did not want to do. All of the activities were very successful. They were organised and focused on outcomes. It was great that the instructors were flexible and this enabled us to go canoeing during our adventure day. The instructors had a great relationship with our children and tried to meet their individual needs. Having the same instructor all week really helped with this. Everything was excellent, but the evening activities were exceptionally good - children were all engaged and enjoying and achieved a lot of success. We have had a fantastic week here, the children have thoroughly enjoyed it! The relationship between instructors and groups was fantastic; communication between Ardroy staff and School staff prior and during the course was really good. All opportunities to learn about the natural environment, themselves and others were taken -outstanding educational provision and memorable experiences for our children. The organisation of instructors and the impeccable routine always makes a smooth day and an easy transition from activity to activity. As always, the food was excellent, and went above and beyond for our children with special requirements. Particularly successful things: Relationships between staff and pupils, the variety of activities and challenge, the response to issues happening in the week. Thank you for a fabulous week - as usual! Looking forward to next year already. The Team building exercises were amazing, and we saw some of the YP blossom. Their confidence has grown over the last couple of days. We would like to thank you from the bottom of our heart for an amazing time at Ardroy. Can't wait until next time! Having the same instructor for the whole week built up a good relationship between pupils and instructor. Also the instructors' encouragement and how they communicated with the children was very positive. Thoroughly enjoyed week, and as always, impressed with standard and professionalism of all Ardroy staff. The consideration and adaption for children with additional needs; and the communication was excellent. Kids had an amazing time. Instructors for to know the needs of the children really quickly. Mixing the two schools for evening activities worked really well. All activities especially briefing & debriefing included pupil voice & choices. Excellent. Really positive experience for all. Children achieved beyond their expectations in meeting lots of challenges - physical, mental and emotional. Every child has spoken of the relationship that was built with their instructor. The programme of activities suited our pupils. Fantastic week, staff are extremely approachable and easy to work wit. It's amazing how quickly staff build strong, trusting relationships with our pupils. Thank you so much, we've all had a ball! The flexibility of the activity programme to contend with difficult weather conditions. The selection of activities, how they were delivered and the inclusive ethos and level of challenge were all appropriately tailored to the group. The programme content, the experiences and what they learnt without even being aware. Responding to the needs of the kids. Instructors facilitate learning, but didn't lead it, they allowed kids to make decisions. Thoroughly enjoyed our week. The enthusiasm of the instructors, never fazed, always calm to deal with any issues effectively. Many thanks. The children were challenged to overcome difficulties and attitudes, pushing them out of their comfort zone. All instructors have gone the extra mile to make us feel welcome, and always attended to our every need! The centre was well organised - daily meetings were useful. The communication skills of all the staff have been fantastic, both towards the children and adults in our group. All of the children have had a wonderful week of amazing experiences which have challenged them and let them experience success on so many levels. Special thanks to the kitchen staff for preparing a huge variety of tasty meals, and for being so accommodating to every request. And to the cleaners for venturing into the unknown every day and keeping us healthy! We have been so impressed with the staff's attitude to our kids; their positivity and resilience. Thank you very much for helping us (adults) survive for the week! Clear expectations and routines help the children to focus on what they're doing and timescales involved. Relationships between staff and pupils are good from the beginning. Food, once again, was excellent. Memories that last a lifetime are made at Ardroy - parents before we came were telling their children about their experiences here, and we expect this year's group to do the same in years to come. Our pupils have grown in ways that have been a revelation to themselves and their peers. Nice job Ardroy staff! Pupils have gained a wealth of experience through the week. They have become more confident in trying new experiences/tasks, using plan-do-review, and become more independent. Our instructors were awesome at bringing out the best in the pupils, with lots of patience and skills. Pupils got, very quickly, used to the routine of Ardroy. The pupils have had a ball and have created memories that will last a lifetime. An amazing week! As ever, Ardroy has proved to be an invaluable experience for our young people: pushing them to and beyond their limits; helping them achieve things they initially thought impossible, and having an amazing time whilst doing it! The John Muir element was fantastic and every instructor linked the activity to the elements of the award. The instructors focussed on and encouraged the skills we hope to develop in our Crossgates kids! The instructors were excellent, if we had any difficulty they supported us, and were always on hand to help (even in the middle of the night). The relationship they have makes the week even more meaningful for the kids! We had an excellent week and really appreciate all your efforts! Thank you very much! The content, organisation and flexibility of the programme, the learning experiences and the professionalism of the instructors are all fantastic! The children had a fabulous time, and build positive relationships with the instructors. The staff are excellent and take time to get to know our kids. They assessed what the children would benefit from, adapted to the needs of kids, had flexibility to provide more challenge and gave them unique experiences. A huge thanks to all the staff for your commitment and the experiences and memories you have helped our children to create this week. Particularly impressed with the professionalism and enthusiasm of every member of your team. The instructors were inspiring and genuinely cared about the pupils. The food was wholesome plentiful and delicious. Thank you to all the kitchen staff (teachers' diets are starting on Monday!). The location is stunning. Well done to everyone in the Team for making this a memorable experience for all the right reasons. Thank you! We were very impressed with how fantastic the leaders were with our additional needs children. All children are returning to school with a great sense of achievement and lots of self confidence! All the staff from kitchen, office, cleaning, housekeeping, support & instructors are a real credit to the centre! They are all so amazing and helpful. Thank you for making our week here so successful! Having one instructor working with their group for the whole week works so well. Both instructors were very successful at encouraging children to work together and to understand the consequences of their actions. The 'challenge by choice' ethos is very effective. We have had another really great week. Thank you very much. Whole programme was extremely successful. All group leaders led the programme very well, and build good relationships with all our pupils. We were all made to feel very welcome. Children were encouraged to take responsibility for their actions and behaviours. Thank you for a fantastic week! We have thoroughly enjoyed ourselves and children have spoken highly of the instructors & activities. Instructors were fantastic with my children. Great attitudes, great rapport, great instruction! As always we have had a great week. Our pupils remember this place forever. Your staff are wonderful. Developing independence, particularly in those who obviously do nothing for themselves. Towards the end of the week, the children were working well as a team and looking out for each other. Lost at Sea was particularly good for this. The range of activities allowed our children to develop skills and do things not available in school: water sports, risk taking, decision making & meeting challenges head on. Thanks you to all for all your hard work & support during our week. You're doing a great job - keep it up :). Instructors' attitude - friendly, encouraging, brilliant with our less confident kids. Changing children's attitude to the outdoors and to things like food waste. Tailored really well to our John Muir Award outcomes. Lots of food - everyone catered for. Thank you so much. We've had a wonderful weekend. Adventure Day - Brilliant idea! The children really understood why they have to be organised, the importance of working in a team, and discovered lots about the outdoors in one brilliant activity. Top marks. Outwith activities - the ethos and attitude exampler shown throughout the camp has been so positive and has really shown the children how important it is to look after themselves, property, each other, the environment and other people. It has given them the autonomy they needed, and a sense of freedom with enough structure to feel safe. THANK YOU for an amazing week. We have all enjoyed being here SO MUCH! The organisation was excellent throughout and communication with staff and pupils was first rate. A great week with lots of personal breakthroughs for the kids - thank you very much! I would highly recommend Ardroy, I have attended a large number of Outdoor Centres and taken part in numerous residentials and this course has been one of the most enjoyable and professional that I have been on. The professionalism of the staff was excellent, they have at all times looked at what is best for the young people and how they can facilitate activities in such a way that the young people gain a real sense of achievement. Review of the day with pupils- relevant, linked well with course outcomes, encouraged pupils to reflect on what had been learned, decisions and implications of decisions. all have a great sense of humour and we really appreciated everything over the last week. A HUGE thank you to the whole team! A fantastic week! Instructors - as always highly skilled and professional. Extremely good relationships with children and staff. Thank you for a super week. Things that were particularly successful: Relationships with instructors; meeting individual needs; motivation; challenge; safety; encouragement; consideration of others. Ab fab! Thanks for the wonderful weather too! The focussed John Muir programme was successful. Great to be able to liaise with expertise from Ardroy to help us improve our approach to Outdoor Learning. Two small schools working together exceeded expectations for both staff and pupils. Looking forward to the next phase. All the John Muir activities were brilliant - and the rest as well. Outreach support was really helpful and helped to set the scene. Our joint work with Culross added to the experience. Pupils who really needed this experience really benefitted. Appreciated that every request and suggestion to meet needs was met, and adjustments made. This was really a life changing experience for many pupils. The organisation was incredible which made my job so much easier. You were able to adapt whenever we needed to make changes. Thank you for always being flexible and maintaining great communication to all of us so that we always felt involved in decisions. Instructors were excellent, brilliant with young people. All staff were friendly, helpful and professional. Activities were brilliant, and the site is good. We had a suberb week and I was very impressed with the staff, centre and programme. Thank you! Instructors amazing with the Young People. Really made the young people at ease. I went with The Challenge Network [in 2103] and I have to say, it was the best week I have ever had in my life. All the staff are amazing especially the instructors. The accommodation is more than welcoming. The activities are a once in a life time opportunity and there is a fantastic social environment. I would most definitely recommended Ardroy to groups of young adults and school groups. Thank you so very much for the wonderful week we spent at Ardroy. The whole experience was a total success from beginning to end and all the children are safely back home with super memories that will stay with them for a lifetime. We could not have wished for a more enjoyable week and were thrilled with the scorching weather that lasted for the five days. 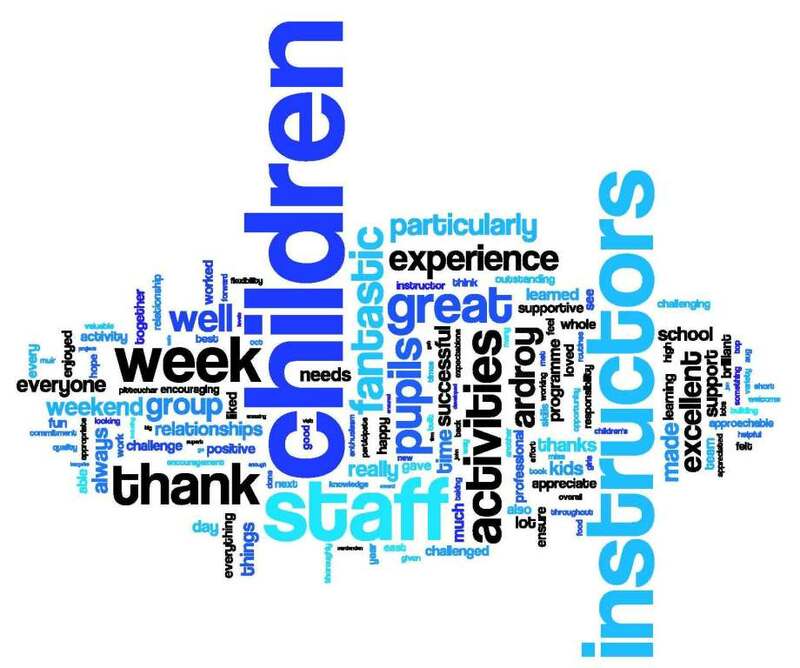 The staff are a credit to the Centre and went the extra mile to ensure that: the week was perfectly planned and organised; the grounds were tidy and maintained; the dormitories were clean and comfortable; we were very well fed and watered and the instructors gave all the children such a great time. The instructors must be praised for their enthusiasm and commitment to active and outdoor learning. It's very impressive how quickly they get to know the children and manage to support and encourage each one to overcome their fears and fulfil their potential. I know that the children will have plenty of stories and riddles to entertain their families after their week at Lochgoilhead. We're now on the last lap and looking forward to our summer holidays on Friday. I wish you all a lovely summer and hope that the midges don't drive you too mad! Staff all excellent and very welcoming and supportive. They got to know the children quickly and were able to meet their needs. Great for teambuilding skills. The instructors have been outstanding, teaching has been of the highest order and nothing has been too much trouble. Ardroy has been great at responding to feedback as the first lunch was not large enough and portion sizes since have been excellent. Everything was run very smoothly and the teaching staff from Beaconhurst have felt very welcome. Thank you to all the staff for providing our school with a super introduction to Ardroy. The overall organisation was excellent, not too much 'down time' for children, and the expectations and responsibilities they were given were good. Impressed by the professionalism of the instructors - patient and good natured, even under trying circumstances! Thank you for going the extra mile! The quality of activities was excellent. Expertise of instructors was great, and the kids learned loads. Thank you for a brilliant week. We look forward to seeing you all again next year! Staff were very friendly, flexible and approachable. Local schools mixed together worked well. Variety of activities and the children's views were taken on board. A BIG thank you! The children and staff have had a great time. The children have enjoyed a good mix of challenge and enjoyment :). The experience the children have been given and the lasting memories created. It has been a fantastic week, the children have had an amazing time. They are exhausted! Thank you :). Great system for getting kids ready for activities - very organised and efficient. Onus on kids to tidy tables & clear up after meals. Instructors were friendly but professional. The took chances to explain things around the area. Fantastic attitude. We really really enjoyed our stay (staff and pupils. Beautiful area, superb food, great range of activities, and of course instructors. Thank you very much for everything. We really liked the appreciation of food waste. The kids have really responded to this. The instructors have been great at building relationships with kids, they have been very aware of individual children's boundaries, and excellent at dealing with their behaviour. Children really enjoyed the activities, and were encouraged to meet and then exceed their personal targets. Food was excellent - everything possible was done to meet childrens' needs. Thanks to the catering staff. Excellent cleanliness - thanks to the cleaners as well. A fantastic week - thanks to all the staff! Met the needs of all pupils, including ASN. Instructors managed behavioural issues excellently. Staff were made to feel very welcome and settled throughout. Efforts all instructors go to to meet "challenging" needs of our children is fantastic, and ensures peace of mind for school staff. Children really valued their own instructors and have been really enthusiastic about all tasks. Right balance of encouraging participation and knowing when to allow children to 'save face'. As always an invaluable experience for the children - lifelong memories made. All Ardroy staff friendly, welcoming and happy to cater for all needs. Instructors completely engaged and attentive to needs. V. patient, and pitched it just right. We really enjoyed working with Nicky - she made sure that the content met our needs & wishes. Great all round experience for kids and adults! We've had an excellent time - thank you so much to everyone involved. The group instructors were fantastic, and the children have gained so much from their week. We particularly liked the emphasis on building teamwork and working together. The instructors were very good at encouraging the children to help each other - some needed lots of encouraging! The children loved all the activities. It was great to see the children on Adventure Day far surpassing what we thought they would be able to do. Flexibility of course and options! Great to be able to discuss best options with the group, and respond with challenging & fun activities. Great instructors - from the start a positive relationship was built, ensuring that the group felt safe and happy throughout their stay. The instructors were fantastic with the children, built great relationships, and encouraged them through difficult moments. Both were appropriately firm and patient when required. The night walk, nightline & labyrinth were fabulous. Teamwork and enterprise skills really improved as the week progressed. Children became more reflective as they linked experiences and learning with the Plan-Do-Review model. The opportunity to stand back and observe their progress and achievements within the 4 capacities of the CfE, and their development needs to be taken forward. There was excellent communiction between Centre staff and school in the programme design and implementation. We'll definitely be back soon! For our group, the opportunities for decision making and independence has encouraged the children to be more reflective of their decisions, and how successful (or not) their decisions were! The instructors 'read' the children really well & immediately formed positive relationships with them which continued to develop throughout the week. As a result of this, the children knew they could trust the instructors, which led to the children achieving in areas/activities that they might not have otherwise attempted. Thank you. We really enjoyed the activities that were offered, and we liked the involvement of the children in forward planning/risk assessing the activities, and the links back to the John Muir Award. The promotion of the zero waste is great. The staff have been great at going with what the chidren wanted to do. The instructors are all really knowledgeable and their interactions with the kids is excellent. Thanks for a great week! Gaining experience of & being excited by the natural world. Very knowledgeable, organised, helpful and efficient staff who work extremely hard to make each activity fun, safe; and are super with the kids. The course was far more than we expected, with consideration given to include everyone. It was a fantastic, confidence building experience that helped to push the boundaries. Ardroy staff were very intuitive at catering for all individual needs within the groups and ensured everyone felt valued and respected. They built up excellent relationships with the children and were genuinely interested in them. All were made to feel safe and secure with the children encouraged to think through risk awareness and make their own decisions. All instructors were motivational and fun! As ever, the instructors and organisation of activities was excellent. They all adapted their programme to suit the needs of all pupils and took time to get to know the pupils as individuals. Thank you all very much for a great week, the pupils I'm sure will never forget their Ardroy experience! One of the best residential trips my group has been on. All young people and staff work really well together. Abseiling and all the activities were great. Thank you so much to the Ardroy staff, and to the cooks - best porridge ever :). Thank you, can't wait to come back :D.
The instructors were superb! They were excellent at motivating the children to try new things and succeed in all ventures. Talking about "squish the risk" really made children think and gave them some responsibility for their own safety. All staff were extremely approachable and supportive when needed, and the focus on waste food was really thought provoking for the children. Overall a brilliant week - thank you all! Where to begin? The schedule and the constant reflective practise to inform the next steps, in order to meet the needs of our children, cannot be faulted on any level. As always, the 'Lost at Sea' day brings everyone together through team work, and putting into practise the skills learned throughout the week. The children thoroughly enjoyed it! The centre was warm & cosy, and very comfortable. The food was excellent! The staff showed an outstanding attitude, and created a relaxed and accepting atmosphere that ensured that positive relationships were forged. The links to CfE and life skills were apparent throughout, and the logbooks were great as a reflective tool. The Instructors were all fantastic with the children and built a very positive relationship with them. Each child was treated as an individual and their needs were met successfully. We cannot fault the activities or the work of the instructors. It has been a brilliant week for all! Really fantastic week. The children have been given an experience they will never forget. We have seen such a change in some of the children. I think they have gained so much, have learned a lot about themselves and have acquired skills they will take with them throughout life. Thank you for such a lovely week. We hope to see you again next year! We particularly liked the approach with the pupils and how the instructors encourage the pupils to think for themselves. All the staff are very friendly at all times. Everyone had a great time, and a lot of life skills and friendships were developed. Children are already asking when Pitteuchar East are returning! Well done and Thank you. Instructors were fantastic and got to know the children really well in the short space of time that we were here. Every child was able to "shine" during the activities. The instructors were flexible and adapted the programme to ensure the children had the best experience possible :). Plan-do-review; Children beginning to use this on their own, and are now working together. Ali and Cam supported groups and teachers in every single way they could. Children and instructors built up a relationship over the week, and this made the week even more enjoyable. The children loved the freedom to explore and discover the woods on the Woodland Day. The fact that there is a strong emphasis on teamwork, thinking about the activities they are doing, how to help each other to achieve - it's not just about 'getting the activity done', being the best or first. Also the time and effort given to ensure the girls were happy, felt safe, and understood what was going on; and being taught how to store and look after the equipment. Meal times - loved the message of zero food waste. Surprised the girls bought into it, but they did and went away with something think about. Having the wet weather gear available for all makes a great different. Canoeing, Jacob's Ladder, Squeeze all very successful. Very much appreciate labyrinth being added on Sat night following the girls' request. Keeping the instructor with the group for the whole week is particularly valuable, and allows children to build a relationship often meaning they will push themselves a little further. Instructors are excellent in building relationships with children and adults. Communication & support between Ardroy staff and school staff superb. Routines effective and well structured. Thank you for a terrific week. All of our children (and staff) have challenged themselves in different ways, and have achieved many things. Instructors - enthusiastic, great commitment. Made it for the kids. V intuitive to our group. Activities - really good mix. Lost at Sea gave that additional activity boost. We have thoroughly appreciated the support of all staff and instructors this week. The partnership with us is genuine and that's what makes it work. The initiative games evening was particularly successful; short timed activities with clear outcomes in terms of team work. Using prior learning to improve on subsequent activities worked extremely well. As always, a thoroughly professional and well organised week. The children have, and will continue to benefit enormously from their experiences. A great week as always - thank you. The structure of the days worked really well eg specific times to meet, meeting up before meals, kids taking responsibility for cleaning and tidying up. Independence encouraged; children doing almost everything themselves. Taking collective responsibility for dorms etc. Instructors encouragement for children who were not so confident. Flexibility, kids make choices, plans and decisions. The night time routine was good, the kids did not go to bed 'hyper' and settled quickly. Review of the day with instructors - impressed on pupils opportunity for reflecting on their outdoor learning and goals. Flexibility re programme with regards to weather. Centre - excellent location, everything on the doorstep. Staff - outstanding, supportive & always encouraging of all pupils & staff. Climbing wall - a well hidden gem. Thank you to all for another excellent week. All pupils will have many great memories to treasure. Instructors' approach to groups was outstanding! Always professional, always supportive, and a high standard of knowledge and understanding of age group needs. Children learned a lot and will leave with a most memorable experience. Thanks! The whole programme and quality of provision was great. All activities allowed for fun and challenge, and offered appropriate choice to the children. Thank you from the whole Ladybank group. A fantastic experience which all the children have thoroughly enjoyed and gained from. All the staff excellent at dealing with the children, including those with difficulties. The complete programme/experience is an excellent package - living together, challenge, new experiences and FUN! Thanks to all the staff for a superb week. We had a fantastic week, enjoyed by all. All activities were organised brilliantly. Children and staff faced challenges and learned things about themselves, Instructors were approachable and sensitive to individuals needs. Lots of skills to keep learning in the classroom. Your Staff (CPD) weekend is on the cards! Routines are established early, and clear instructions given to the children. The activities are great, and appropriately challenge the children. Responsibilities in the dinner hall/dorm duties are very valuable. The instructors are very helpful and approachable. Overall Ardroy promotes a very positive ethos, and it is great that the children are encouraged to participate in the best interests of their team - another valuable skill for moving on to P7 and High School. Super week! Well done instructors and staff! There was a good variety of activities for the children, and when they finished early, the children were kept occupied. The instructors were very knowledgeable about and supportive with the activities. We have had an excellent week here at Ardroy, and both teachers and children have had a lot of fun. Thank you especially to Russell and Keith for being fantastic instructors and giving us an unforgettable experience!! With one particularly challenging group, the instructor was very patient with them - this was much appreciated. The staff rooms were very comfy, appreciate the beds being made up. Once again, can't thank all the staff at Ardroy enough for a fantastic week. The kids always go back 'little adults' having learned lots about themselves. Just a quick message to say thanks for the Tanshall staff weekend at Ardroy. Everyone went home tired and happy. Cam was an absolutely excellent instructor, as was Kev who joined us for some of the activities. We were made to feel very welcome and were well looked after. The food was excellent and the facilities top notch. We will hopefully be back soon! Very impressed with all the staff. A well devised programme. Overall a quality learning experience - the children had a ball. The activities ensured the children met the four challenges of the John Muir Award. Some instructors modified their programme so that the children were able to pursue areas of interest. Our children with additional support needs were dealt with really well. It was great to see them being successful and enjoying learning. The quality of the instructors is a strength of the centre. We are very happy with the role that Ardroy has played in the link project. We particularly liked: All the activities A good structure to the day Enough 'social' time The enthusiasm of the instructors and the positive interaction with the children. Staff felt totally relaxed during the 'Ardroy Experience' all due to the expertise of the staff. All staff worked well with the children. They motivated them in every activity, and also took time to get to understand them. Thank you for a very packed week. We would like to stress the importance of the relationship between the instructors, pupils and school staff; and we feel that the Ardroy staff appreciate this too. They are very committed, professional and approachable to all. They understand all the children's needs and ensure that they can all participate. They have made us feel very welcome and were happy to have us along and participating in the activities. Together we have been able to iffer the pupils a wide variety of opportunities to support them in their John Muir Award. Anne's the best cook in the WHOLE WORLD! Porridge was AMAZING**** & so was the.......EVERYTHING! A huge thank you to Simon, you were a legend!!! The balance of activities and the routines established were great. Thank you for a super weekend! Particularly successful things: Focus on helping each other, whilst encouraging independence. Planning and preparation with children, involving the children in the decision making. Appreciating the wishes of the group. Particularly liked the woodland walk, and the working together & teamwork. A fab time had by all J. The professionalism of all the staff and instructors was outstanding, incredibly knowledgable, and sympathetic to the children's needs. They understood the children, and gave them a degree of choice and responsibility. Great to see Ardroy going strong and having such well qualified instructors. Long may it and our visits continue. CfE is being ticked in all the right boxes. The instructors took a lot of time to explain and discuss tasks in a professional and personable way. They were really encouraging to the most reluctant pupils to achieve what they thought impossible. It was ideal that the waterproofs, fleeces and wellies were provided. The course more than met our expectations! Our stay at Ardroy has been fantastic from start to finish. The children have enjoyed every aspect and have learned such a lot about themselves and each other. All the instructors have been great fun, professional and have a fantastic way with the children. We really appreciated the efforts made to make our visitors on Wednesday feel so welcome, and become a part of things while they were here. Many thanks again for making this such a memorable experience for us all. The instructors were brilliant! They were caring but firm, encouraging, approachable and chatty. All the staff were friendly and helpful. Thank you for a fantastic experience. Hope to see you soon. Ardroy offers a positive, challenging & stimulating environment, allowing children to fufill their own personal journey with support and encouragement. Instructors took on board individual group targets, and worked towards them throughout the week. We really appreciate the extra effort from Rob to create an amazing Adventure Day. We are looking forward to finding out more about integrating the 'Ardroy Experience' into the curriculum throughout the year. Once again we had a brilliant week. Our instructor Ken was excellent. He had a lovely rapport with the group & ensured everyone had the opportunity to participate. Excellent provision for dietary requirements. Looking forward to Sept '14 when we return again. Thank you. Particularly successful things: Organisation of the children's day - always knew what they were supposed to be doing. Outcomes always explained and expectations stated. A brilliant weekend. Thank you from all of us. The instructors' interactions & relationships with the children were excellent. Organisation of the whole week was great. The buildings were so clean. Thanks again for a fantastic week - we are looking forward to coming back next May. Great relationships formed from the beginning of the weekend by staff. Children were challenged but not forced, so they felt comfortable taking part and challenging themselves. Liked how the meals made the children think about what they were eating and had some peer pressure to ensure they hit meal waste targets. We have had a great weekend. The children have felt safe, secure, happy and challenged in their activities, and enjoyed working with their instructors. Thank you for a great weekend everyone!! Instructors all very positive, firm and fair, and also very helpful and supportive. Very high standard of safety. The overall experience for the children was very rewarding; for the children who had been before they could build on previous knowledge and experience, and for the new children they tried a range of activities and built relationships and skills. Everyone has been very supportive and responsive to the needs of all the children and staff. We hope to return again next year. Thank you! Our kids loved the food and were wondering if your cooks could deliver to our school :). All the instructors were fantastic with the kids. The children said they loved the Splosh although it was freezing! Big thanks to everyone who made it a fantastic weekend the children will never forget. Ali and Suzie were fantastic instructors & far exceeded our expectations. Their commitment, patience, enthusiasm and passion have been outstanding. Both developed fantastic relationships with all the children and helped them to appreciate each others' strengths. Their support to us as staff members meant that we were totally confident in their ability to lead the group, and were able to relax and enjoy the week as well. Thank you to all the staff at Ardroy for your commitment, passion and enthusiasm. Staff and pupils from Cardenden have had A BALL!!! It's difficult to actually state a particular activity that was more successful than another. They were all great! Canoeing - the thrill of being on the water and seeing some real wildlife. Climbing wall - An appropriate challenge for pupils of all levels. The instructors worked very hard to ensure each group had an appropriate activity. Expedition - this was a challenge for everyone and will be remembered as it was tough but fun. The pupils choosing their own kit and camping spot (within reason) allowed them to both show their initiative and gave them a sense of responsibility. The rain was an added bonus! Beach clean - gave the pupils a great opportunity to actually do something that showed that they cared for the environment. Jacob's Ladder - gave the pupils a fantastic team building experience; they had to communicate effectively otherwise they had no hope of reaching the top. For some pupils - due to the fear factor (which they overcame with much encouragement from their fellow team mates) this was a real achievement. The instructors were top class. They made the extra effort to engage and get to know the pupils. Also their competence at instructing (including importantly the safety) was second to none. Everything has been brilliant. The Young People have been challenged, and loved every minute of it. A Big Massive Thankyou! Thank you very much for having us. We have enjoyed everything, and everyone has learned something new this week :).